Summary: In 1969, talks ensued between the US and the USSR focusing on the limitation of nuclear weapons. 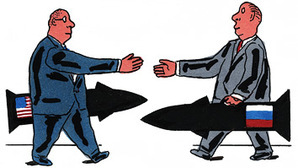 Although these talks pushed for peace, they led to the creation of more ICBM's in secret. Quote: "The main threat to peace posed by nuclear weapons today is the growing instability of the nuclear balance. This is due to the increasingly destructive potential of the massive Soviet buildup in its ballistic missile force." Question: Would the cold war have ended differently without the SALT talks?